“Hi, I’m Adele and I’ve worked at Noah’s Ark as a staff nurse for 18 years this year. From the very early days I developed a particular interest in mental health so I gained a qualification in that area too. It’s a subject I feel very strongly about because as far as I’m concerned, there is no health without mental health. “The number of children and young people admitted here in mental health crisis is far higher than I think most people would expect. The patients range between 11 and 16, though some are younger, and can present with a range of issues from self-harm to eating disorders. A number of young people also arrive from A&E or intensive care having attempted or with thoughts of suicide. Some are admitted because they need urgent medical attention, others because they need close monitoring to keep them safe. A certain amount already have diagnosed mental health conditions while others have developed issues as a result of some kind of childhood trauma. Often the thought running through my head when I’m listening to these children and young people tell their stories is “An adult would find that situation almost impossible to deal with alone so there’s no wonder that you are struggling. 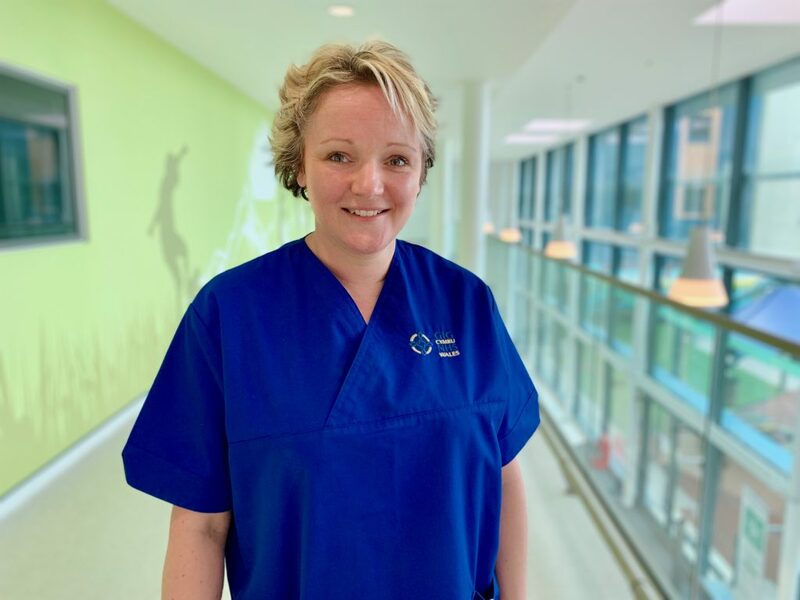 “My role as a mental health nurse has several elements but my main objective is to bridge the gap between the children’s hospital and the CAMHS team (Child and Adolescent Mental Health Service), who will ultimately be the ones to support that child or young person moving forward. I also provide training for the nursing team around caring for children in mental health crisis. It’s a complex issue and one that not many nurses have a great deal of experience or training in initially, so I’m here to help them feel confident. Because what’s vital to all of us here is that we do our best by every child. “When I’m first introduced to a child on admission they’re usually very traumatised. They’re at their lowest ebb, often frightened and just want to run away from the situation. There aren’t many nursing roles where the ideal footwear would be running trainers but mine certainly should be! Most of the time though, my job with that young person is to give them the time and space to talk and the reassurance that they will get help. Having to tell your very difficult story over and over again to various people along the hospital stay can be very painful though, which is again where my role helps. I can pass on the relevant information to the relevant person at the relevant time, which takes that burden from the patient. “My role involves providing support to families too. Mental health is still a very difficult thing for an adult, yet alone a child, to talk about so I’d say in around half of cases, a parent will have had no idea that their child has been suffering so much. I’m there to provide support and empathy to parents right at that point of crisis when everything has just happened and they’re feeling completely overwhelmed. “One of the most common things children and young people in crisis say is that they don’t need help or they don’t deserve it. When I hear something like that I’ll ask them how they would feel if a child with a broken leg wasn’t being helped. I tell them it’s the same thing but it’s just a different part of them that hurts and sometimes what’s going on with them can take a little longer to heal. That’s why it’s so important to de-stigmatise mental health. Just because you can’t see it like you could see a broken leg, it doesn’t mean it isn’t there.